The British-American policies in Iraq have not been a failure, since the goal has been to achieve Tony Blair's vision of a post-Westphalian Treaty world. The notion of a modern, sovereign and independent nation-state under which flag many ethnic and religious entities could coexist as citizens of one nation, is becoming a thing of the past, at least in Southwest Asia. Since at least September 11, 2001, and emphatically since the act of aggressive war (according to the Nuremberg Tribunals), this has been the policy of the British Empire and its partner the Bush-Cheney and, later, Obama Administrations. The offensive launched by the relatively small Salafi-Islamic terrorist group, the Islamic State in Iraq and the Levant (or the Islamic State in Iraq and Syria, ISIL/ISIS), on the second largest city in Iraq, Mosul, and, later, Tikrit, has shaken the region and the world. However, it has to be emphasized that the ISIL has no possibility of taking over such a large city and territory by itself, let alone exerting any control over large cities or territories without support from regional or even world powers, in addition to collaboration of local tribes and political/armed groups that are opposed to the central government. In the smaller context, and according to many observers and local analysts, this offensive has been in the works since the re-election of the political alliance of the current Prime Minister of Iraq Nouri Al-Maliki. Saudi Arabia and its allies in Kuwait, the United Arab Emirates, and even Qatar have made no secret that they were disappointed by this result, giving an Iran ally, and his Shi'a alliance renewed control over the government and the political life in most of Iraq. This happened simultaneously as the Syria Army of Bashar Al-Assad government was achieving major victories against the Anglo-Saudi- and Obama- backed Islamic terrorist groups in Syria. Al-Maliki had waged a massive military operation against the ISIL and its supporters in the local tribes in western Iraq in the Anbar Province in November/December but was not completely successful, due to tribal wheeling-and-dealings that involved Saudi Arabia and its allies, in addition to corrupt deals made by Maliki with Sunni leaders in that province. Both Russia and the U.S. Defense Department supported Al-Maliki's offensive in Anbar. The ISIL move into Mosul was a signal for other forces to move to complete the sectarian division of Iraq. The ISIL was able to invade the city of Mosul, because the military, security, and police commanders ordered their troops to abandon the city without a fight, and then they, themselves, sought refuge in the militarily powerful Kurdish region. The local armed forces and police commanders are accused of treason by the central government. Many of them are former members of the Iraqi Army under Saddam Hussein's regime that was dismantled by the regime-change-commander-in-chief, Paul Bremer. They turned into the resistance movement against the U.S. Army, but later were appeased by General Petraeus's "surge" policy, which tried to appease these forces, and paid and armed them to be incorporate into some local security forces. However, that was done not on the basis of being part of a national army, but on the basis of protecting their tribe, clan, and local area. This made them strong rivals to the central government, which had to fight their influence and the infiltration of Al-Qaeda and ISIL into their ranks all by itself after the U.S. army left Iraq! After Mosul, the ISIL then moved to Tikrit, a stronghold of the Saddam regime loyal tribes who were completely humiliated and stripped of all economic, social, and political privileges after the American-British invasion in 2003. They were later side-stepped by the Shi'a-dominated, but U.S.-backed new government that looked at those western province tribes as their former tormentors and Saddam's henchmen. Left to their fate, these tribes, who in addition share ancestral lines with tribes in Syria, Jordan, and Saudi Arabia, became an easy prey for the Saudi Wahhabi or extremist Sunni propaganda and money. According to eyewitness reports from Mosul, the ISIL have already left the center of the city, because they use their limited forces to attack other cities, like locusts, farther south towards the capital Baghdad. This triggered a number of reactions, or already planned moves. In the absence of any Iraqi formal army, the Kurds extended their security zone into disputed areas (with the Arabs) in both the Mosul province and oil-rich Kirkuk under the pretext of protecting the Kurdish minorities from the ISIL. Since the Iraqi army and security forces are no longer reliable, Shi'a clerics in central and south Iraq like Ammar Al-Hakim and Muqtada Al-Sadr are forming or rebuilding their own Shi'a militias to stop the advance of ISIL and its "Sunni" supporters into Shi'a cities and other cities where there are Shi'a religious sites like Samarra, north of Baghdad. This move will turn the conflict completely into a Shi'a-Sunni strife. Bloodshed can be expected to increase in the mixed areas north of Baghdad, and even Baghdad itself. While the ISIL is not going to be capable of keeping control over such a vast territory in the western provinces of Iraq, it is expected that local Sunni militias will be formed to prevent the return of whatever is left of the Iraqi army. Local political and governing entities could also be formed in the Mosul, Salhaddin, and Anbar provinces, to form an autonomous region like the Kurdish one in the northeast and Shi'a in the south, thus actualizing the division of the country. But, unlike the Kurdish and southern Iraqi regions, the western region has little oil and gas resources, the sole source of income for Iraq since 2003! This will make the fight over the oil in the border regions among the three, and the ways of exporting it to Turkey, Jordan, or Saudi Arabia, a major open source of conflict, like that in South and North Sudan. In the meantime, the Sunni tribes in the western provinces of Iraq will have to rely on support from Saudi Arabia, Kuwait, and the U.A.E. But the price they have to pay is in their own and their other Iraqi compatriots' blood. In terms of regions, Turkey (a Sunni state), which has been supporting anti-Assad Salafi terrorist groups, has vowed to intervene as a NATO member (!) in Iraq and would love to intervene directly into Syria, under the pretext of fighting the ISIL who have taken the Turkish Consul and many officers in the Turkish Consulate in Mosul as hostages. Iran has offered the Iraqi government assistance in fighting the terrorists. The Saudi press, although paying lip service to the Saudi official anti-terrorist stance, is full of schadenfreude over the failure of the Maliki government. In Kuwait, rallies were held in support of the ISIL! In the larger context, this remains part of the pattern of regime-change and "color revolutions" that have swept over large parts of southwest Asia and North-Africa, in addition to Eastern Europe. Tony Blair's vision is being implemented, with blood in Southwest Asia, North Africa, and Ukraine, and with financial warfare against the nations of Europe, who are being stripped of their sovereignty through the bail-out and bail-in policies. And in the United States, British stooge Obama is presiding over the total take-down of what little was left of the real U.S. agro-industrial economy. Leading the pack, as usual, is Sen. John McCain (R-Ariz.), grandstanding before and after Thursday's classified briefing of the Senate Armed Services committee on the Iraq situation. The Hill reported this morning that McCain, on his way to the briefing, "called for the president to clean house on national security as a wave of Islamic extremists threatened to march on Baghdad. President Obama should 'get rid of his national security team, which has been a total failure.'" The article continued that "McCain left the closed-door briefing after only a matter of minutes, telling reporters the security situation in Iraq 'is the greatest threat since the Cold War'" and that he said "the administration should 'call back in people who succeeded in Iraq' such as Gens. David Petraeus and Jack Keane, widely regarded as the architects of the U.S. military's 'surge' strategy." Russian Foreign Minister Sergei Lavrov slammed the British by name on Thursday, noting that the ongoing events in Iraq show the absolute failure of Anglo-American policy. This Lavrov statement should be seen in the context of the May 23 Moscow International Security Conference panels, where Lavrov and other top Russian and Belarus officials slammed the West's new "color revolution" warfare. Under the headline "Lavrov: Iraq developments show total failure of American-British 'adventure,'" Russia Today highlighted Lavrov's pointed attacks on the Brits. "It has been reported that the UK foreign minister declared that the events in Iraq are, according to him, an illustration that terrorism is rampant in the region due to the absence of reconciliation in Syria," Lavrov told reporters in Moscow. "We've known that our English colleagues have a unique ability to twist everything. But I didn't expect such cynicism, because the events that are taking place in Iraq are an illustration of a complete failure of the venture started by the US and the UK that allowed it to spiral out of control completely." Lavrov added, "We express our solidarity with the Iraqi authorities, the Iraqi people who should restore peace and security in their country, but the actions of our Western partners raise a lot of questions." Lavrov went back 11 years to President George W. Bush's declaration of victory for democracy in Iraq, noting that "the situation has deteriorated in geometrical progression. The unity of Iraq has been called into question. The rampant terrorism is taking place due to the fact that the occupation troops didn't pay any attention to the interior political processes, didn't help the national dialogue, and only pursued their own interests." In the same discussion with reporters, Lavrov also addressed the crisis in Ukraine, noting that the Russian Ambassador to the UN, Vitaly Churkin, will be asking the OSCE mission in Ukraine to thoroughly investigate the use of indiscriminate weapons against civilian populations in Odessa on May 2, in Mariupol on May 9, and the sniper fire on the Maidan in February. He added that Russia has now submitted a draft UN Security Council resolution demanding a halt in the violence and military actions. That McCain should be voicing such sentiments is unsurprising, but a little ironic, as the International Republican Institute, where he is chairman of the board, has been fomenting uprisings across the Middle East and North Africa since at least 2011, and al Qaeda and other militant Islamists have funneled their forces into those uprisings. McCain, himself, famously met with al Qaeda-aligned troops in Syria last year while he was busy promoting a war there. The Hill reported that McCain also specifically called for the resignation of Joint Chiefs Chairman Gen. Martin Dempsey. The article further reported that "McCain said later on the Senate floor that the withdrawal of U.S. troops from Iraq was dictated by politics and not by the nation's security interests. 'All of this could have been avoided,' McCain said of the growing strength of al Qaeda-linked jihadists in Iraq. He warned they will use the territory they control in Iraq and Afghanistan to plot and launch attacks against the United States. He accused the Obama administration of squandering the security gains that cost the lives of 4,486 American soldiers and cost U.S. taxpayers what a 2013 Harvard study estimated to be $4 trillion to $6 trillion. McCain blasted White House Chief of Staff Denis McDonough, Obama's former deputy national security advisor, for telling reporters in 2011 that Iraq was secure, stable and self-reliant. ... Instead, McCain said the unraveling of Iraqi security is a 'colossal failure of American security policy.' McCain said air strikes should be considered to slow the insurgents' advance. 'Explore all the options of air power. Get a team over there to advise them,' he said." McCain's frequent allies in national security pronouncements were not far behind here. Lindsey Graham (R-S.C.) also called for airstrikes: "There is no scenario where we can stop the bleeding in Iraq without American airpower," he's quoted in The Hill. And GOP national security poster-girl Sen. Kelly Ayotte (R-N.H) was quoted by The Hill as having "said the deteriorating security situation was due to the Obama administration failing to secure a status of forces agreement with the Iraq government that would have allowed U.S. troops to stay in the country. 'We're seeing the unraveling of Iraq,' she told reporters before the meeting, expressing concern for the security of the U.S. embassy there. She said the ongoing crisis was a 'lesson for Afghanistan' and chided the president's recent West Point speech where he announced all troops would be out of that country by the end of 2016. 'I hope the president would take some of the lessons of what we're seeing happening in Iraq and not repeat them in Afghanistan,' Ayotte said." Other Senators had comments on Iraq as well; The Hill noted that "The only common view among those who attended the classified session is that the U.S. should not send in ground troops." Sen. Bill Nelson (D-Fla.) said the U.S. should consider the use of drones with hellfire missiles if "Iraq nears collapse." The Armed Services Committee leaders were not so precipitate. The Hill quoted GOP Ranking Member Sen. James Inhofe (R-Okla.) that it was too early to call for airstrikes. And Chairman Carl Levin (D-Mich.) was reported by The Hill to have said that the Iraq War was started "without adequate consideration for the consequences," and that the United States should carefully consider its options. Levin also faulted Iraq's Shi'ite-dominated government for not reaching out to Sunni citizens, and suggested that airstrikes wouldn't help the situation on the ground if forces loyal to the Iraqi government wouldn't fight. "It's unclear how airstrikes on our part can succeed, unless the Iraqi army is willing to fight, and that's uncertain given the fact that several Iraqi army divisions have melted away," Levin said in a statement. "While all options should be considered, the problem in Iraq has not been so much a lack of direct U.S. military involvement, but a lack of reconciliation on the part of Iraqi leaders." Meanwhile, House Speaker John Boehner (R-Ohio), always one to reduce a situation to partisan advantage, blasted the President for "taking a nap" while conditions on the ground worsened. "It's not like we haven't seen this problem coming for over a year, and it's not like we haven't seen, over the last five or six months, these terrorists moving in, taking control of western Iraq," he said. He evidently didn't address what he failed to do as "we" saw this coming. 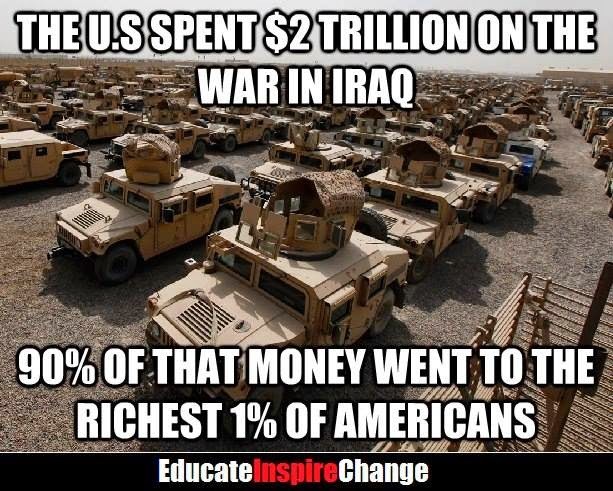 The U. S. politicians (aka Empire stooges) spent $2 trillion on the War in Iraq, 90% of that currency created went to the richest 1% of Americans. And generations of poor sheeple, including immigrants will have to pay back with their hard works and time.